Uglyworld #517 - Turtle and Ice-Bat Send A Postcard (134-365), originally uploaded by www.bazpics.com. 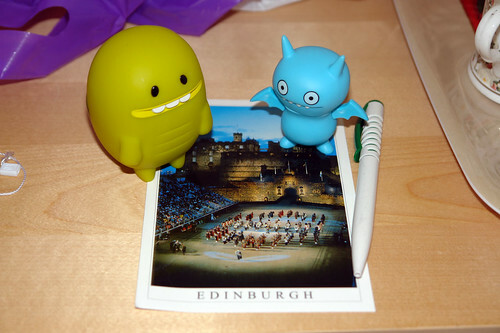 Turtle and Ice-Bat had bought this postcard while they were visiting Edinburgh Castle last Sunday, but due to the large amount of places they had to visit this week it meant the postcard took a few days longer to be written. Mireille asked Icy who it was for but he wouldn't say, only telling us that it was going to a friend of his, only time will tell then!